He’ll appear on the Netflix talk show this weekend. 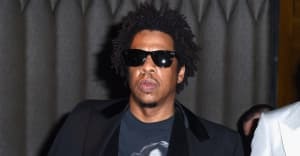 JAY-Z will be appear on David Letterman's Netflix show My Next Guest Needs No Introduction this month, and a new preview for episode has just been released. In the short clip, JAY-Z explains a couple of qualities that make someone good at rap, specifically noting having a good voice, for which he notes Snoop Dogg, and having "amazing cadence," for which he points to Eminem. JAY-Z's episode will air April 7 on Netflix. He's the fourth guest on the monthly show, following former president Barack Obama, George Clooney, and Malala Yousafzai. Watch the full trailer above. Thumbnail courtesy of Michael Kovac/Getty Images for NARAS.